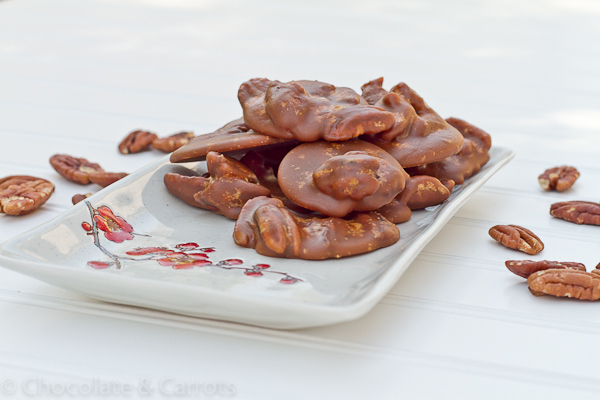 If you haven’t had a praline. You NEED to. There are possibly the best candy out there…and that’s coming from a chocoholic! 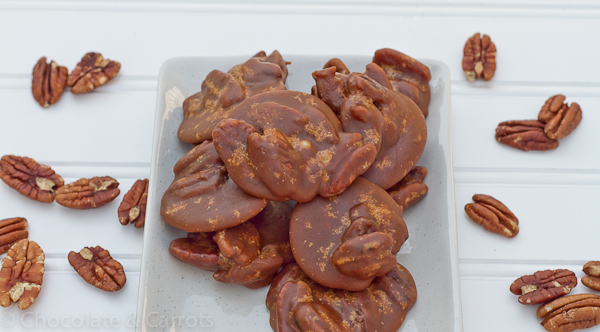 Pecan pralines are my mother’s favorite dessert. Luckily there are multiple candy shops in the Charleston area that makes them fresh in the store. Either that, or head down 95 to Savannah, Georgia…where Paula Deen and the Savannah Candy Store make some mean pralines (mean in a very tasty way). 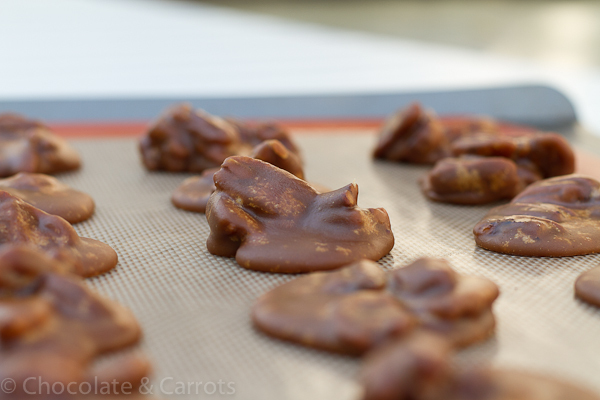 I’ve made pralines for a couple of years now and have never used a candy thermometer. Until this time. I got one for Christmas and it definitely helped me to keep track of how much longer I was going to have to stand there watching and stirring the pot. If you don’t have a candy thermometer, that’s okay too. It takes longer than you think it does to make them, especially when you’re standing there smelling the power of the praline. Just make sure you get it to a golden brown color and then cook it a little more for extra luck! There’s been a couple of times (without the thermometer) where I thought it was done, but really it hadn’t gotten hot enough and never would set/harden. But, that’s okay. If that happens, just scoop the pralines up with a spoon, pop some in the microwave for a couple of seconds and top your favorite vanilla ice cream with it! Yum!!! Just store the rest in the fridge until you want to top some more ice cream! 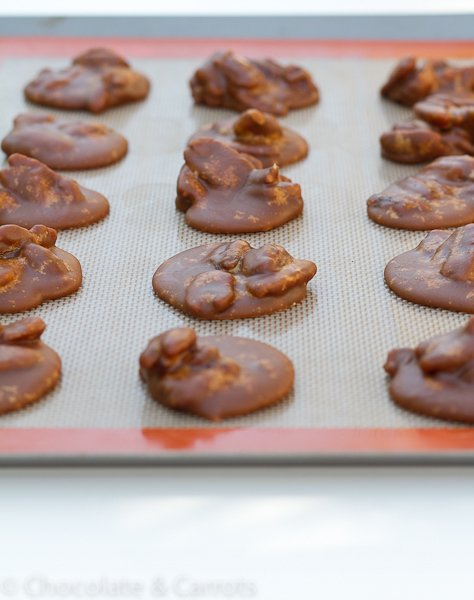 This go around, getting the pralines all the way to 234°F (in combination with having to switch pots because I had forgotten how much the candy swells up with the heat), I got them a little darker than I usually like. But, don’t worry, they taste just as good. They have a more caramel taste. I remember growing up and in the summer time going to my great grandmother’s house (Granny) in Charleston. 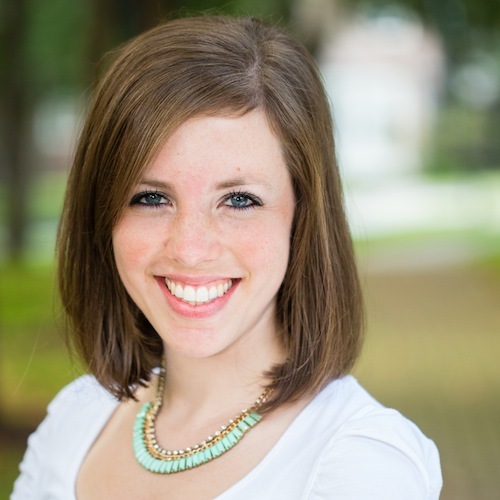 We’d pick oodles and oodles of pecans from her giant pecan tree in her back yard. We’d have pecans coming out of our noses…and we even shared with the squirrels! In a large pot, combine the first 5 ingredients. Over low heat, stirring occassionally, until the sugar dissolves. 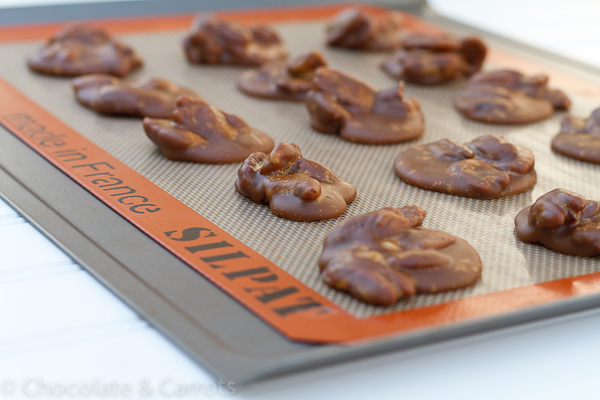 Continue to cook over low heat until your candy thermometer reads 234°F (This takes about 15 minutes). The sugar mixture will also bubble up to a little more than double the size. 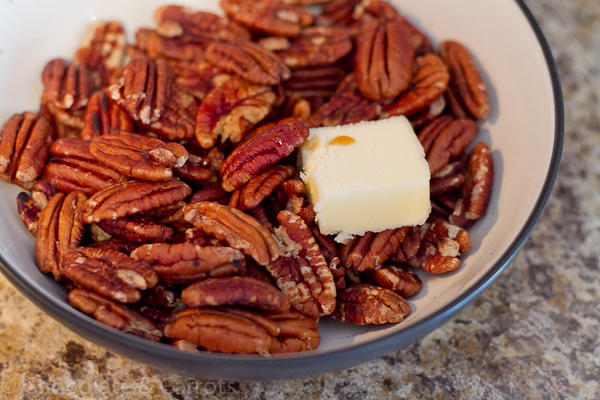 While the sugar mixture is on the stove, combine the pecans, butter and vanilla in a small bowl. Set aside. Also set out at least two baking sheets covered with wax paper or silpat mats for later. Once the thermometer has reached the correct temperature, remove from the heat and let it stand for 5 minutes. Stir in the nuts, butter and vanilla and beat with a wooden spoon until the mixture begins to lose its shine (about 6 minutes). Working quickly, drop by the tablespoon onto a silpat mat or wax paper. Let them stand for 20 minute or until set. 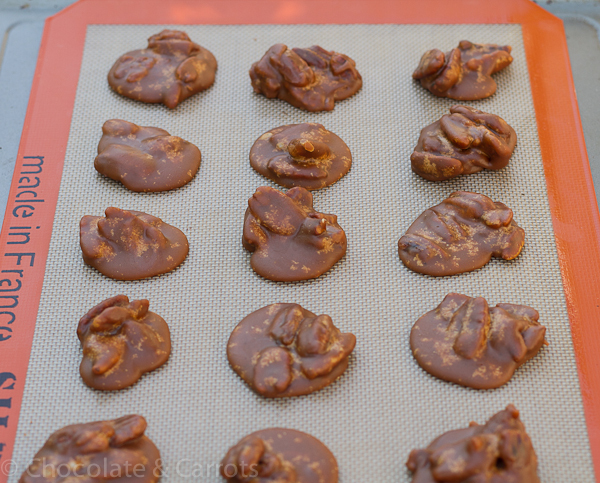 Note: Store pralines in an airtight container for up to 2 weeks. 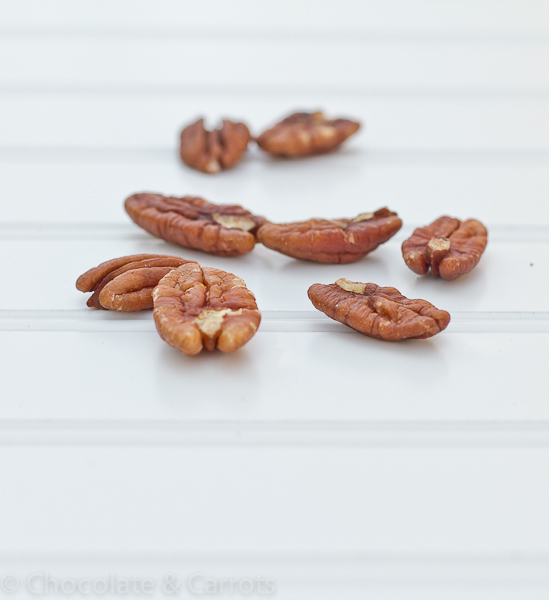 So tell me, who’s had a pecan praline before and did you like? 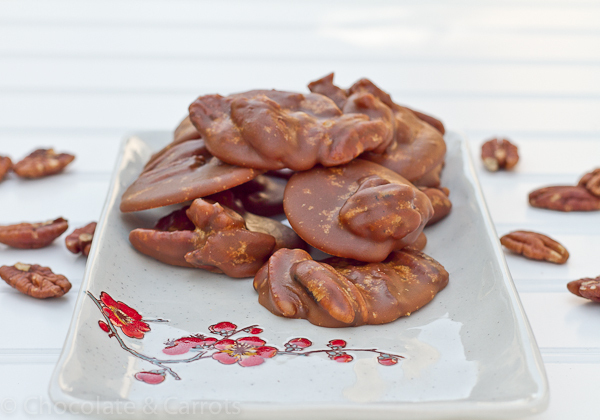 I have never made a praline but I do love to eat them! You have inspired me to give it a try! I love Charleston and I will always buy pralines when we drive down to Savannah. Thanks for sharing this. I am off to Amazon to find a candy thermometer. I am not sure I could time it without it. I need to get my hands on a candy thermometer. Love your pralines. Mouthwatering! Ooh yummy – these look perfect. Pralines are my FAVORITE candy ever! When I lived in Florida, I used to always drive to Savannah and stop at the Savannah Candy Kitchen. These look soooo good and I wish I could eat them all right now. YUM! 🙂 Your post seriously made my day. Mmmm! My grandmother makes this every Christmas-they’re amazing!